Okay: credit where credit’s due. First, “Ontario Line,” as a brand, works just fine for me — even, as is likely, if we won’t have termini at either the Ontario Science Centre or Ontario Place within our lifetimes. Relief is about indigestion, not transit. It was time to move on. Second, Doug Ford’s Tories deserve a measure of praise for formally stating that the Ontario line needs to open before the Yonge Street extension — a somewhat surprising declaration, and one that the Liberal government, it’s worth pointing out, never made. The political hedging about the staging of these competing projects endured right until the end of Kathleen Wynne’s time in office, and now, thankfully, it appears to be over. Beyond these two points, however, yesterday’s big bang announcement created far more questions than answers – about funding, technology, stations, and planning in general. In many ways, it reminded of the time when Ford and an old pal of his, then working for the Toronto Port Lands Corporation, hired a two bit freelance planner to concoct an entirely fictional port lands redevelopment plan, which was never more than a set of jazzy renderings with an impressive price tag. I’ll defer to other commentators to ponder the murkiness around the $28.5 billion (but probably way more) required to finance Ford’s latest subway fantasy, as well as the province’s thinking about how to bring the city to heel (i.e., how we lose ownership of the asset but are forced to pony up billions to pay for it). Rather, I’d like to focus on the planning aspects for the Ontario Line. Certainly, if we could somehow fast forward past an immense amount of process and conflict, to a moment when some revamped version of Ontario Place — or the acres of adjacent parking lot — sports some kind of major destination (arena, casino, convention centre, etc. ), rapid transit access won’t seem like a daft idea. I’d invite the skeptics to re-visit those long-ago debates about the proposed locations for the SkyDome and the Air Canada Centre. We got those decisions right. That said, the elephant in this room is that the western leg of the Ontario line obviously doesn’t address the problem it was originally intended to solve, which is providing an alternative route into the core from points west. The St. George interchange will soon become as dangerously over-crowded as Bloor/Yonge (thanks to increased volume along the Spadina extension as well as transfers from the Eglinton Crosstown). Ford’s plan does exactly nothing to address that problem. 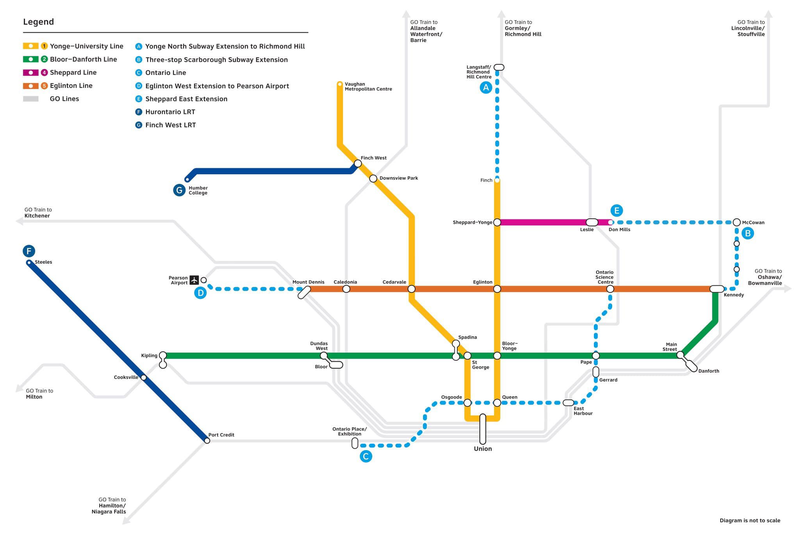 The segment of UP Express that runs between Bloor West and Union will become a more fully realized short-cut in a few years when a tunnel extending between the Dundas West and Bloor GO stations opens, although this alternative route is destined to remain a premium service with a measure of inconvenience. A few years ago, Metrolinx bruited the notion of terminating the western tail of the Relief line at a proposed commuter hub to be located near the south-west corner of Front and Spadina. That hub, with connections to GO trains coming from Kitchener, Milton and Barrie, would take some of the pressure off Union Station and also provide a link to the subway system. The important planning detail, however, is that that version of the Relief line didn’t just stop; it connected to other parts of the network. The Exhibition end of the Ontario Line, by contrast, seems to exist entirely to deliver warm bodies to whatever that destination becomes. The back-of-the-envelope quality of Ford’s plan is even most apparent along the eastern leg of the Ontario Line, and specifically the area where it will curve north from the Queen corridor and head up towards Pape Station and beyond. In his announcement, Ford claimed the new light-rail technology he wants to use can go over the Don River instead of tunneling underneath – a configuration he contends will save megabucks. Whoever conceived of this hare-brained idea evidently didn’t spend any time looking at the Google maps of the area where Queen and the Don River intersect. According to the latest Relief Line alignment plans (which have been subjected to a substantial amount of regulatory due diligence), the route will dip south of Queen Street as it heads towards the Don River. On the east side, it will head towards a new station serving the giant East Harbour redevelopment site, at Broadview and Eastern Avenue, just steps from the proposed SmartTrack/GO station within the Unilever/Great Gulf precinct. The line then proceeds east under Eastern Avenue before turning northwards at Logan. What’s anything but clear is how, under Ford’s plan, this light-rail line will get out of the tunnel west of the Don; where it will cross the river; and how it will re-enter a tunnel heading east. One need only look at the streetcar tunnels at St. Clair West or along Queen’s Quay to realize that the entrances and exits gobble up an enormous amount of space, simply because the grades can’t be too steep. Moreover, the city blocks on either side of the Don in that vicinity are packed with condos, construction sites, valuable historic buildings, narrow streets and public spaces, like Corktown Common. It’s by no means obvious where those lengthy tunnel entrance/exit ramps will fit. And even if the engineers tasked with finding a solution can figure out how to thread the needle, the daylighted portion of the Ontario Line will need to be shoe-horned between apartment blocks and parks, etc. Either that, or the Ford government’s got to get to work expropriating and demolishing property. All the looming complexity raises difficult questions about the extent to which the city will be permitted to plan this line. Doug Ford’s subway bridge over the River Don introduces a deeply challenging planning dilemma in a congested space with little fallow land, a gnarly road network, lots of new residential development, and a relocated highway (i.e., the relocated Gardiner/DVP interchange). Left to its own devices, the city might opt to find ways to mitigate all the expense and disruption to local residents. The question is, will Queen’s Park allow the city to plan, or will it play the ever-present constitutional trump card and impose its own approach, local concerns be damned. Versions of this conflict will likely play out in many other parts of the city should the three orders of government come to terms on the financial contributions and actually begin planning these lines (low odds). Indeed, this process, whenever it happens, will vividly illustrate just how much local authority, if any, the city actually retains in the era of Fordian transit planning. As reported here yesterday, the $621 million needed to build and connect a Queen’s Quay East LRT to Union Station is nowhere to be seen, even though the city submitted a funding request to the fed’s transit infrastructure program last year. The question I’d pose now is whether the Liberals are prepared to push the Ford government to green light funding for the Queen’s Quay line in exchange for a federal contribution to the expanded Ontario Line. Great overview. I saw Bill Morneau last night. Luke warm is putting it mildly. I wondered about whether the Waterfront LRT might manage to slip in under the radar. Having a Waterfront LRT running from the EX Go Station out to the Portlands and connecting at East Harbour with a loop at Union would be a huge boost to growth along the Water. I almost don’t want to discuss the Ontario Line. I think it has virtually zero chance of being built. If it were to get built, starting at Eglinton isn’t an awful idea. I never understood the City’s plan to end at Osgoode. To make it really usefull it feels like it should terminate at Dundas West. Maybe have a spur near Liberty village to terminate at the Ex, but if you’re putting shovels in the ground, extending to Dundas West makes the most sense. As for Scarborough, I never got the one stop subway idea. If you’re building the line, you might as well add a couple of stops. Sadly, the Feds won’t commit to anything this year. If they sneak back in they might toss in a billion. Maybe 2. But 12? Not ever. And definitely not if the province owns the lined and the air rights. Furthermore to the discussion about getting over the Don River, is the challenge that the flood protection land forms will present. On the west side of the Don, the land form is in place; it’s that grass slope of no man’s land between the river and the line of where the Canary District condos start. On the east side, the land form will extend approximately to the face of the existing Unilever building for the land south of the Metrolinx/Via rail corridor and on the north side it will be somewhere around the rail bridge over Eastern. This flood protection barrier can not be pierced by tunnel openings for obvious reasons. So the tracks are going to have to come to grade and go over a significant distance of not just the Don River but also the width of flood plain on either side. Oh and, there’s that rail corridor again in the way so what, this new rail line will go over that too? There’s land to expropriate on the east side I guess, although most of downtown’s gas supply runs through the Eastern Enbridge facility. On the west side, is the government going to expropriate entire condo buildings and demolish them? This train is going under the river. The Ontario Line they drew crosses the Don in two places. While crossing the Don at Queen above grade makes no sense, this may not be what they meant…they may have only meant the north crossing of the much deeper Don Valley which does make sense as an above grade bridge between East York and Thorncliffe Park, in the same way that the current Line 2 is above grade (running under the viaduct). There’s a lot to digest, and a lot to be suspicious of. Why aren’t we looking at using surface transit like GO for that Yonge Relief, or the DVP, or other options? It does make sense to get something new up to Eglinton to actually give value, but if Relief is such a City priority, and system need, why are we still OK with squandering billions to extend the Danforth end of the subway up to STC? Also, I’m getting to think that maybe this is a way of $crewing the core by sucking in the other levels eg. feds and City, though maybe some compulsion lurks, to pay for a line that may be ‘needed’ (without exploring the full options of Relief function), and then, because it’s stand-alone apart from the TTC, selling it off, and pocketing the contributions while allowing prices to rise like the 407, and oh, the deficit made us do it, but we couldn’t charge the cars…. nor squeeze their ‘freeway’….